White paper on crime 2004 Part5/Chapter4/Section4/2. Urgent aftercare of discharged offenders is provided to prisoners who complete their sentence(those released on completion of their sentence and those whose term of parole has expired),those who receive a suspended sentence without supervision,and those subject to suspension of prosecution.Urgent aftercare is granted most often to those who complete their prison sentence. In principle,urgent aftercare is available within six months after an offender's release.This period is determined to provide aftercare services only for the period immediately after release when aftercare is most necessary,and to prevent offender's dependence and promote their self-help.In recent years,however,those offenders who are unable to prepare for their own living within six months has increased due partly to the increase of older offenders(See Chapter5,Section3-2(3) for details).Therefore,the extension of available term by another six months is permitted for those who meet a particular requirement. Urgent aftercare of discharged offenders includes(1)providing accommodation with or without meals;(2)providing meals;(3)providing medical and health aid;(4)providing work clothes and other clothing;and(5)providing or lending travel expenses to next abode.Each type of aid is provided by the government,through directors of probation offices or through entrustment to organizations such as the Juridical Persons for Offenders Rehabilitation Services.The former is called governmental aid, and the latter,entrusted aid.At present,meals,clothing,medical aid,and travel expenses to next abode are provided as governmental aid,and accommodation with or without meals are provided as entrusted aid. Fig. 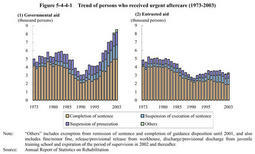 5-4-4-1 shows trend of persons who received urgent aftercare of discharged offenders since1973by aid type.Persons who received governmental aid have increased sharply in recent years,while those who received entrusted aid have increased slightly.Due to the limited capacity of halfway houses,the number of persons who can receive entrusted aid has not increased remarkably,which results in a growing demand for governmental aid.In2003,8,545persons received governmental aid,and3,298received entrusted.More specifically,as governmental aid,travel expenses were provided to1,608persons,meals to1,477,and clothing to398(Source:Annual Report of Statistics on Rehabilitation).